WARNING! Turn away if you are hungry! 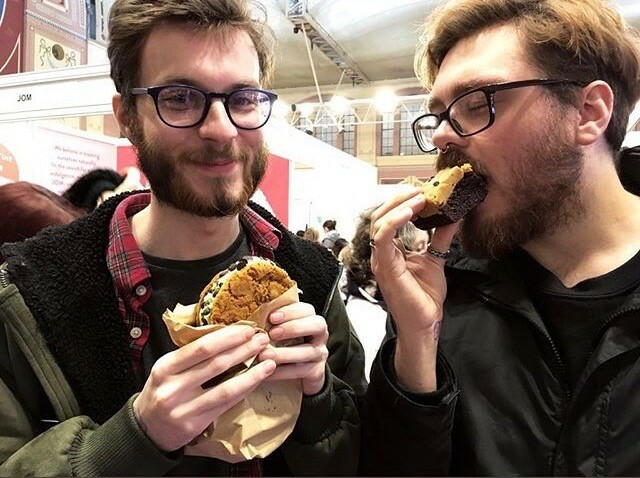 Tim Wynne tucking into a delicious cake and his partner tucking into a burger! I’m late to most things. A never ending reminder of how out of touch and easily excitable I am. I’ll be the first to admit to that. Just this year I’ve discovered the brussels sprout, as if by voyage to unchartered lands I’ve discovered something previously unimaginable. I am, easily, that one friend in the group desperate to show everyone a cool new coffee shop around the corner only to lead them to a decade old Starbucks. It’s something innate I’ll likely never shake off. Brussels sprouts aside, food is the exception to this rule. Here’s everything I’ve learned about how to eat (so far). A sufficiently blended pasta sauce can hide any vegetable. Lettuce can be added to any sandwich with the right conviction. Maybe not jam or peanut butter though. And a one-pound limit for the pick and mix on a Friday can negate the worst of anxieties around tooth decay. The fruit salad ones can even pull out the most stubborn of milk teeth. Two Pounds worth of pocket money gives you an entire Saturday of freedom. A milkshake from the leisure centre, popcorn chicken from KFC. You’ll be running around so much, there’s not enough time to worry about the calories. Home Bargains will have a box of soft cookies for a solid month that will give you, for 59p, one each while you and your friends wait for the rain to stop. A lot of gloopy, sticky rice and lentils. You won’t notice you’ve not had a Sunday Roast in months. You’ve always hated them anyway. A weekly shop for the three of us, twenty pounds if they can spare it. Tinned chickpeas can save any meal and fill any hunger. You’ll learn the timelessness of beans on toast, and the stew your father can make with all this free time. You’ll regret the weekends of KFC. Go a little mad on spinach smoothies, and not have the heart to tell your Mum you fancy joining a gym. You’ll go through a lot of couscous and soup. Eat your first salad and never look back. Stay behind after lessons because your teacher thinks you’re ill, and you’ll laugh that it’s an old jumper gone saggy in the wash.
Olive oil is the new black and the gym just isn’t for you. You’ll slice cherry tomatoes in half like it’s nobody’s business. Master the art of caramelisation. Learn what it takes to feed a home, a new home of new friends, on a low income but do so proudly. Revel in peasant food and the joys of plastic bread in the morning. The sticky rice and lentils make a comeback, but now it’s a daal with dried coriander leaf and the sticky rice is perfect for your trendy new chop-sticks. Salads can be fun, but a happy person they do not make alone. Cooking out of love, and necessity, takes much of the shame out of eating. You’ll get there, you can feel it.